Family day trips to Maine were one of my favorite parts about growing up in Connecticut. The focus of the journey varied. It might be Freeport, for shopping at L.L. Bean’s flagship store; Kennebunkport, for picturesque waterfront views; or Kittery, for piles of candy at Yummies and bargain-hunting at the outlets. Regardless of the destination, we always made it a point to stop at the Maine Diner for a bite to eat. While some in the group chose any menu item made with lobster, I was rather crustacean-shy in those days, so I stuck to the landlubber side of the menu. My usual order was their homemade macaroni and cheese with a giant hot dog on the side. Oh. So. Good. Using the diner’s recipe as a starting point, I’ve created a velvety, delightfully cheesy, and absolutely irresistible (oh yes, and gluten free) version of the dish that can be enjoyed without a trip to Maine—especially useful now that I live in California. 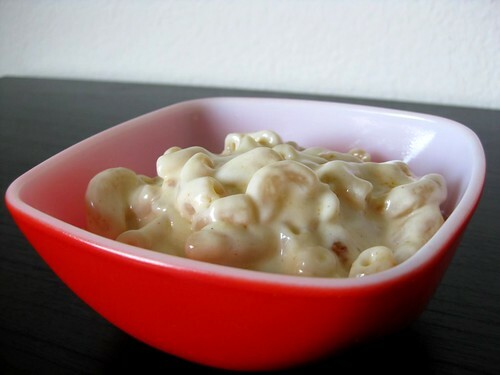 Even though preparing macaroni and cheese from scratch involves making a roux and béchamel sauce, it’s not much more difficult or time consuming to make than the boxed variety. I really encourage everyone, regardless of skill level, to make this recipe—it’s so worth the extra effort. Enjoy! Preheat the oven to 350°. Bring a large pot of salted water to a boil; add pasta and cook for about 6 minutes or a few minutes shy of al dente (it will be pretty crunchy still, but will finish cooking in the oven). Drain pasta in a colander and rise well with cold water, set aside. Rinse and dry the pot used to cook the pasta, place over medium heat. Melt butter in the pot, then whisk in millet flour (this mixture is your roux). Continue whisking roux over medium heat until it just begins to change color (read: turn golden/brown)—about 30 seconds to 2 minutes. Slowly whisk half and half into roux (now you’ve got a béchamel sauce in the works). Switch to a wooden spoon and stir constantly to prevent sticking. Bring mixture to a simmer (can take anywhere from 10 seconds to about 5 minutes), and continue to cook until the mixture thickly coats the back of the spoon and if you run your finger through it a distinct track remains (about 1 to 5 minutes). Remove the pot from heat. Add cheese and spices, whisk until smooth. Stir in drained pasta. Transfer mixture to an 8″x 8″ (or larger) glass casserole. Sprinkle the top with Parmesan and paprika. Place casserole in the preheated oven and bake for 20 minutes or until bubbly and hot. If you want a browned crust, set the oven to broil after the 20 minutes are up and watch the top carefully. Remove when it reaches the desired color—this should take no more than a few minutes, but it really depends on how quickly your broiler warms up. Serve immediately. ¹ While brown rice pasta can be used to make this (and works really well in some recipes), I find that a more sturdy type of pasta works even better. Bionaturae makes the elbows that I use most often for this dish. It’s on the pricier side for pasta—a single, 12 ounce bag at Whole Foods is just under $4, in contrast to Trader Joe’s brand of brown rice pasta that’s $2 for 16 ounces—but it has a really nice texture and flavor.